The original edition of this book was written for nonﬁnancial managers of every stripe, engineers and marketers and operations people alike. This edition has been developed speciﬁcally for information technology professionals. It is for the senior IT executive who has not yet picked up the ﬁnancial skills he or she needs to become an effective advocate, leader, and business partner. It is also for junior and midlevel people on their way to positions of greater responsibility—the IT leaders of the future. Given that focus, we should begin with an observation that we think many—perhaps not all—of our readers will agree with: IT and ﬁnance sometimes have a rocky relationship. For one thing, IT departments have a reputation for spending lots of money (and always asking for more), yet they often have difﬁculty demonstrating their impact on the bottom line. Measuring IT’s impact can be complex, both because the effects show up only over time and because it is up to other departments to implement and use the work IT does in supporting their business processes. Also, some of what IT does is infrastructure support. That keeps the business running smoothly, but it’s certainly tough to quantify. For another thing, IT often reports into the ﬁnance organization, with the chief information ofﬁcer reporting directly to the chief ﬁnancial ofﬁcer (CFO). That can be a great relationship, or it can be difﬁcult. For instance, ﬁnance may be focused primarily on controlling costs, even while expecting IT to improve and increase its level of service. Then, too, CFOs typically think in quarters, since they must report (and explain) quarterly results to analysts and investors, and IT people necessarily take a longer view. Whatever the difﬁculties, IT people need to be able to speak the language of business if they expect to have a good working relationship with the CFO (or the CEO, for that matter). And the language of business is numbers. Many IT professionals have been developing that skill set in recent years. But perceptions are hard to change, so people in your organization—even in your department—may still see IT as the big spenders, unconcerned about costs and proﬁts. Boosting your ﬁnancial intelligence can help change that perception. If you can speak the language, ask questions, and use the information, you will be a part of the wave of change in IT. This is an excerpt from Financial Intelligence for IT Professionals: What You Really Need to Know About the Numbers by Karen Berman, Joe Knight, and John Case, published by Harvard Business School Press, 2008. Copyright 2008 Business Literacy Institute. All rights reserved. 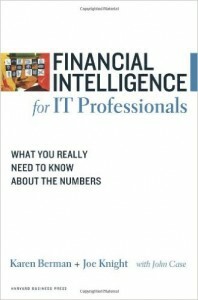 Purchase Financial Intelligence for IT Professionals through Amazon.